Unique experiences to discover Lyon! A must-see visit of Lyon! Lyon City Bus offers you a ride at 4 meters high with a panoramic view of the entire city to visit the emblematic places of Lyon. Discover Lyon at your own pace! Hop on and hop off easily all day long with the 14 different stops, the double decker buses will drop you at the city's exceptional sites: walking through the Vieux Lyon, a trip to the Confluence district or going up to Fourvière... everything is accessible with the Lyon City Bus! Enjoy your weekend in Lyon with 2 days of bus with our Pass Duo! An unusual walk in the heart of Croix-Rousse! Take a seat on the Lyon City Tram and discover this emblematic district of Lyon. Stroll through the steep streets of this "village in the city" and enjoy exceptional views of the Amphitheater of Trois Gaules and Fourvière. The panoramic roof will allow you to admire the famous painted walls of Lyon such as the Fresque Végétale Lumière, the Wall of Canuts or the Fresque des Lyonnais! Ideal for the all family! And to complete your visit, discover on foot the famous traboules of the Croix-Rousse (indicated with a star on the map). Find the plan and the schedules below! A Duo Pass to miss nothing of the City of Lights! You are in Lyon for 2 days? The Duo Pass is for you! Enjoy 2 days in our double decker buses. 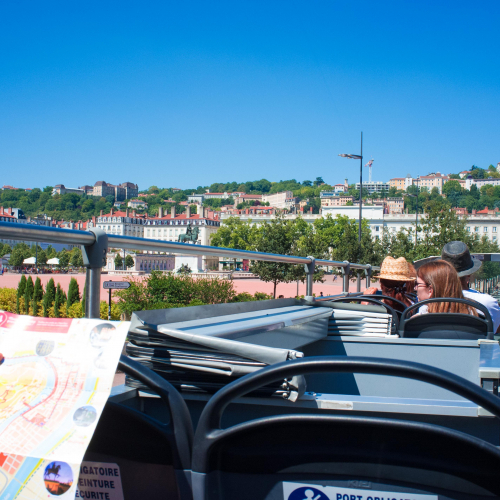 With Lyon City Bus, discover the emblematic districts of Lyon and reach the top of the Fourvière where you can enjoy a breathtaking panoramic view of the city! And with the Lyon City Tram, continue the same day visiting the slopes of the Croix-Rousse, discover the famous painted walls of Lyon and learn the history of this atypical district that has made Lyon the world capital of Silk! A great family activity! Perched at 4 meters high, enjoy a panoramic view of the entire city! Hop on hop off all day long with the 14 different stops. Take a seat aboard the small train and explore the steep streets of this "village in the city"! 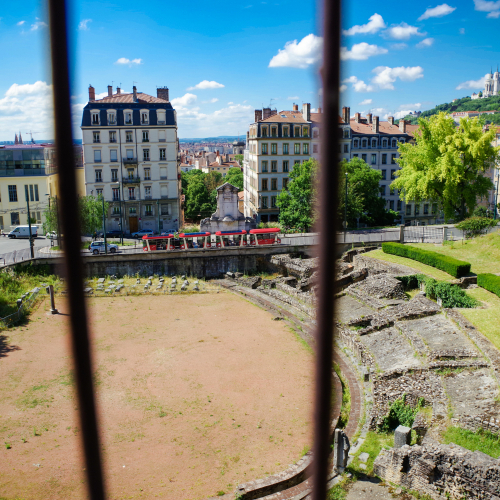 Enjoy an exceptional view of the Amphitheater of Trois Gaules and Fourvière. Get your pass with just a few clicks and take advantage of our special web discounts! Sign up for our newsletter and receive special offers, tips and much more!